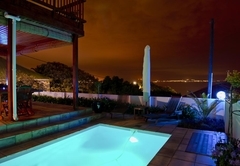 Aquamarine Guest House is a 4 star graded guest house offering Mossel Bay accommodation in 5 guest rooms. 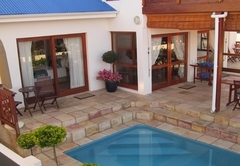 Aquamarine Guest House is an exclusive five bedroom gem, with a fresh modern touch. 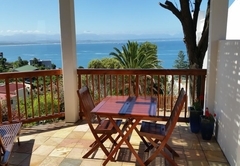 It is centrally located in the main street of Mossel Bay, with secure off-street parking and remote controlled gate. 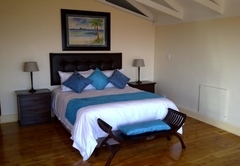 The Guest House is within easy walking distance (10 minutes), from Santos Blue Flag beach, Bay View Shopping & Entertainment Center, restaurants, supermarket and Bay View Private Hospital. 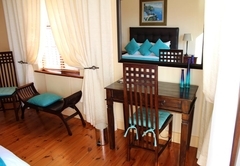 Aquamarine Guest House offers 2 Luxury Double rooms with ocean view and 2 Standard Double rooms without ocean view. 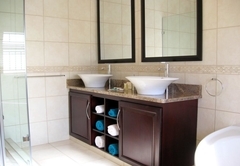 All rooms have luxurious en-suite bathrooms and patios. 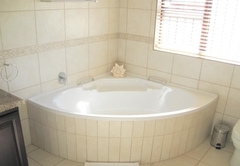 The spacious Honeymoon Suite has an en-suite bathroom and a large private ocean view balcony. 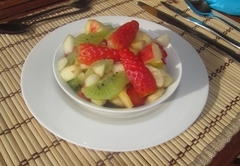 Free Wi-Fi is available in all rooms, the lounge and dining room. 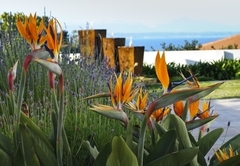 A delicious English breakfast could be enjoyed both on the main patio at the poolside, or in the dining room, overlooking the picturesque bay and majestic Outeniqua Mountains on the horizon. 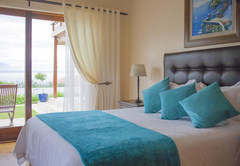 Room facilities include free WiFi, a flat screen HD satellite TV, coffee/tea facilities, bar fridge, ceiling fan, digital safe, luxurious en-suite bathroom, with double basins, a corner bath and rain shower. 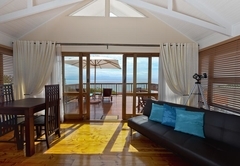 Complimented by a private ocean view balcony. 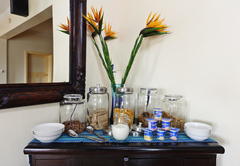 Room facilities include free WiFi, a flat screen HD satellite TV, coffee/tea facilities, bar fridge and luxurious en-suite bathroom, with double basins, a corner bath and a rain shower. 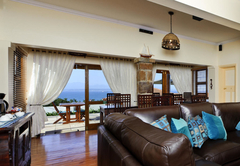 This elegantly furnished room is complimented by an ocean view patio. 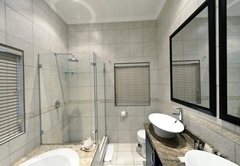 Room facilities include free WiFi, a flat screen HD satellite TV, coffee/tea facilities and luxurious en-suite bathroom, with double basins and both a bath and shower. 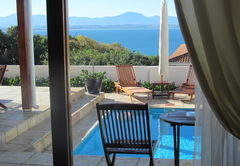 The room has no direct ocean view, but limited garden view from its small patio only. 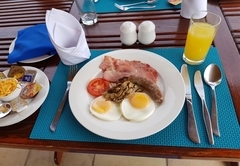 Room facilities include free WiFi, a flat screen HD satellite TV, coffee/tea facilities, bar fridge, ceiling fan, queen size bed, as well as a luxurious en suite bathroom, wtih double basins, shower and bath. This room has no direct ocean view. 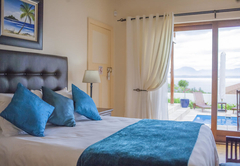 Room facilities include a queen size bed, flat screen satellite TV, luxurious en-suite bathroom, kitchenette, fridge, microwave, private sea view patio. 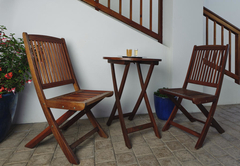 Secure parking, breakfast & free WiFi included. 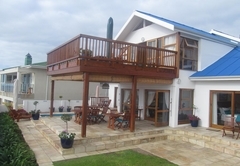 Separate non graded unit only 150 m from Aquamarine. 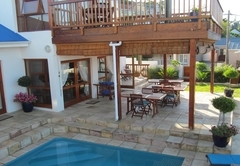 This non-graded room has an en-suite bathroom, shower only, queen size bed, free-WiFi, flat screen satellite TV with DSTV, bar fridge, coffee/tea facilities, garden & sea view patio, secure parking and is approx 150 m from Aquamarine. 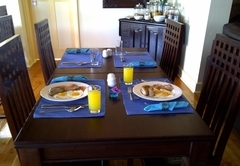 Approx 3 km from Aquamarine (1 km from Diaz beach) Non-graded apartment, free WiFi, secure parking, 3 bedrooms, 2 bathrooms, fully equipped kitchen, lounge, flat screen satellite TV, sea view balcony.Top floor, 3 flights of stairs, shared swimming pool. 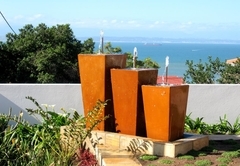 Deluxe double room with private sea view balcony. 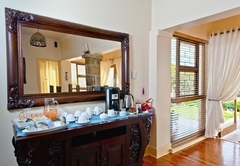 Elegantly furnished, Free WiFi, flat screen HD satellite TV, coffee/tea facilities, kitchenette, microwave, fridge, luxurious en-suite bathroom, with double basins, corner bath and shower. 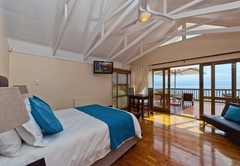 Spacious Honeymoon Suite / family room & private sea view balcony. 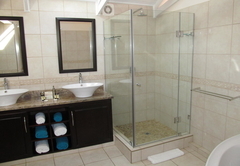 Upstairs, free WiFi, 2 queen size beds, flatscreen HD satellite TV, coffee/tea facilities, kitchenette, microwave, fridge, luxurious en-suite bathroom, double basins, corner bath & shower. 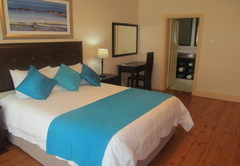 Spacious Superior double room with private sea view balcony. 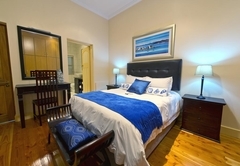 Elegantly furnished, upstairs, free WiFi, flat screen HD satellite TV, coffee/tea facilities, kitchenette, microwave, fridge, luxurious en-suite bathroom, double basins, corner bath and shower. Stunning ! 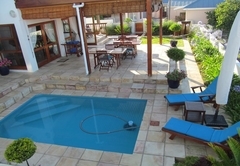 This was our best guest house during our trip along the Garden Route. We recommend it 100%. 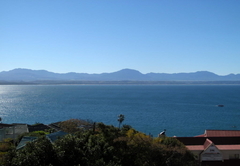 We love Mossel Bay ! Our stay has been fantastic ! The room was beautiful and the staff so friendly and helpful. Would strongly recommend anyone to come and stay here. 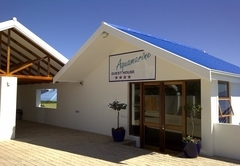 Response timeAquamarine Guest House typically responds to requests in 5-10 minutes. Child policyChildren 12 years and older are welcome, a mattress for children 13-18 years is available on request.